You know, it just seems like nowadays, with the internet and all, it's SO easy to find out about anything by simply googling it. Doesn't everyone use google?? There are beautiful, naturally produced clear quartz crystals found in Herkimer County, NY that are referred to as "Herkimer Diamonds", hence the Herkimer part of the name. They are about 500 million years old. 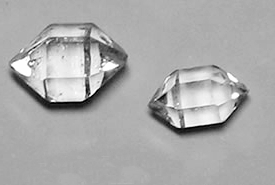 They're called "diamonds" because when they are found, they look like someone faceted them---but they are naturally clear and "faceted" with double termination points, and 18 total facets (six on each point, six around the center). They do NOT "mimic diamonds in their sparkle and appearance" -- they are nothing like a real diamond, but they are exactly like a clear quart crystal because that is what they are. They are ALWAYS double terminated quartz crystals with 18 facets. Their overall shape looks like a "diamond" shape. Quartz crystals are always hexagonal, but a Herkimer is double-terminated (on both ends) rather than on one end like other quartz. This double termination is rare because Herkimers grow with little or no contact with the host rock--they form within cavities in the rock, specifically dolomite. Quartz has a Mohs hardness rating of 7, and Herkimers that I personally had tested also have a Mohs of 7. I've read online that Herkimers are "harder" than other quartz with a Mohs of 7.5, and perhaps that's true of some of the crystals, but it wasn't true with the verified Herkimers that I had tested (by the professionals at Rio Grande Jewelry). People can go mining for these gems, which is a fun way to spend a day. Herkimers were sought after by the Mohawk Indians and early settlers and became popular in jewelry around the mid-20th Century. Are they brighter and clearer than other quartz crystals? Are they special? Some Herkimers are incredibly clear (just like any quartz crystal). The really do sparkle! 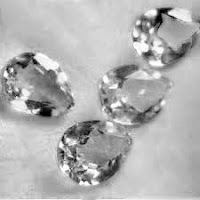 Many people believe that Herkimer "Diamonds" should rival genuine diamonds, because Herkimers are found already "faceted", whereas diamonds are found in the rough and need skilled cutters to bring out their beauty. They are beautiful for sure, but are NOT more sparkling than any other type of clear quartz. Herkimer Diamonds (which are actually Herkimer Quartz) have surged in popularity recently. Lots of people like they idea of a natural gemstone that is easily mined (no "blood diamonds"!) right here in the U.S. Unfortunately, with the popularity of this stone, come unscrupulous sellers offer "Herkimer Diamonds" from Brazil, China, elsewhere in the world. These are just clear quartz crystals that use the name "Herkimer" as a selling point. I've seen a LOT of this online, which is very sad. I guess these sellers figure something like, "Hey, it's the same stone, who cares?" Worse, I've seen faceted clear quartz---faceted like a gemstone, in brilliant rounds, ovals, princess cuts or pears----sold as "Herkimer Diamonds"! How ridiculous!! (see below) The beauty of a Herkimer is its NATURAL shape! Any quartz that is clear and faceted is just that----faceted quartz! "Faceted Herkimer diamonds are conflict-free quartz crystals and possesses a remarkably similar composition to diamonds. Herkimer are known to activate the release of energy blockages, enhance intuition and dreams, and raise energy levels." But a Herkimer is a clear QUARTZ crystal, a common mineral made of silicon dioxide. A diamond is pure, crystalized carbon (the hardest mineral on earth). Their composition is not similar at all. They are certainly conflict-free, so at least they got that right. 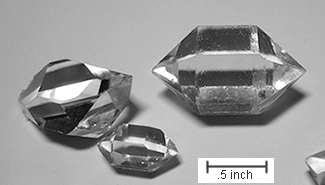 Faceted Quartz, touted as "Herkimer Diamonds"
THE WORST: online are sellers marketing machine-faceted clear quartz as "Herkimer diamonds". Even entire websites and youtube videos are devoted to this. Sellers online will set a faceted clear quartz into a ring setting, and then sell it as a "Herkimer Diamond" and charge a LOT. This is yet another example of "creative marketing". What sets a Herkimer apart from other quartz is the fact that it is FOUND "faceted" in its natural state. The Herkimer quartz itself isn't different in composition than other quartz. Consumers really should take a few minutes online and do a little research before purchasing any "faceted broken Herkimer Diamonds" or Herkimers that originate from anywhere other than New York, if you have your heart set on buying a Herkimer. Any faceted QUARTZ can be colorless and water clear and a beautiful substitute for a diamond! Adding the Herkimer name to the stone doesn't make it better. I'd be wary of any such "creative marketing". Remember, what makes a Herkimer different from all the rest of the quartz is that it is NATURALLY "faceted" and sparkling---courtesy of Mother Nature.